Hello everyone! I have a huge problem while I was cleaning my grill I got oven cleaner on the Aluminum part of the grill. Now it has left this white discoloration on the aluminum. I have tried everything from vinegar to baking soda, I’ve tried scrubbing it off with CLR and it won’t come off. Is there anyway that I can restore it back to the colour it was before? And I can’t just place it in vinegar on the stove like all the YouTube videos show. Please help!! What tools do I need to fix this situation. I have inserted a picture of what it looks like. Thank you for your help! You have given the clean up a great effort, but unfortunately, I believe that you did not stain your side burner lid, you removed the finish. 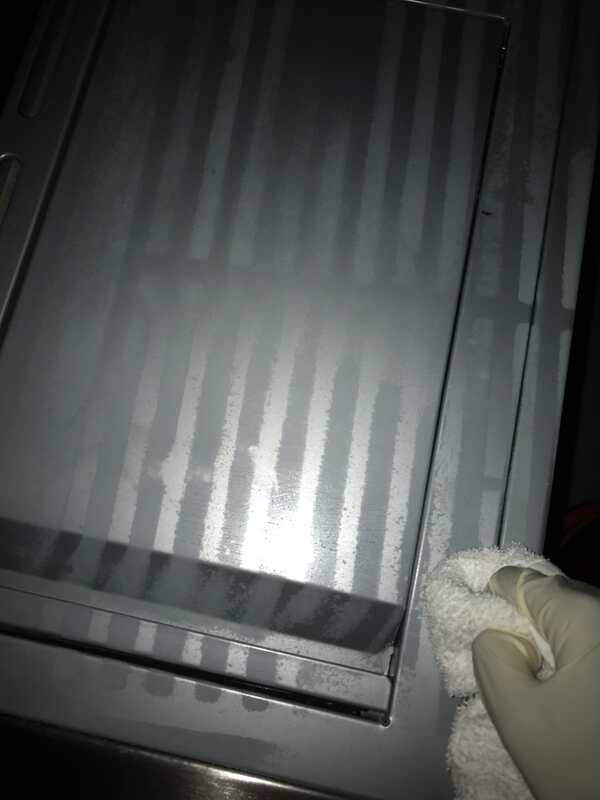 Oven cleaner is a very powerful solvent; it is composed of ingredients that removed baked on, solid, masses, so a light, metal-finish, that comes into contact with the powerful cleaner, could be removed in seconds. The result is that no matter how hard you scrub or clean, the silhouette of the grill crate will never disappear. I spoke with Nexgrill, I explained your dilemma and the representative agrees…the finish is gone! The only option I have to recommend is: that you call Nexgrill with the model and serial number of your grill, you can order a replacement side burner cover, the solution is not perfect, you will still see traces of the oven cleaner damage around the perimeter of the lid, but it won’t be so obvious. The associate I spoke with at Nexgrill was very helpful, give the company a call they have team standing by to answer questions, and for ordering parts.